Edouard Léon Cortès was a French Post-Impressionist artist of French and Spanish ancestry. Born into a family of artists, his father, Antonio Cortés Cordero, was a painter at the royal court of Spain. In this artistic atmosphere, Cortès showed exceptional talent early on, and decided at a young age that he was destined to be a painter. In his youth, Cortès trained at his father’s studio, and was also given advice and encouragement from his brother, who was also an artist and other local artists. 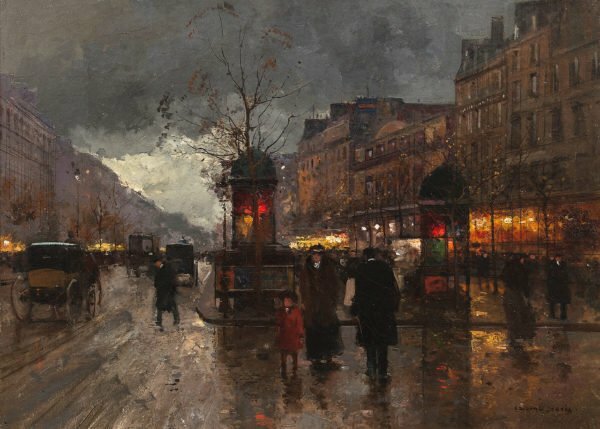 Before undergoing his formal education at the École des Beaux-Arts in Paris, a 16-year old Cortès first exhibited his work at the national exhibition of the Société des Artistes Français in Paris in 1899. The work was well received by the critics and the public, helping establish his favourable reputation in Paris. The press in the French capital awarded this young prodigy status of a legend and placed crowns of victory upon his head. The successful artist married in 1914 and welcomes a daughter 2 years later, however the First World War soon interrupted the life of this young family. Although a pacifist, at the age of 32 Cortès joined the French military, and was sent to the front lines. After spending two years at war Cortès returned home, even more pacifist in his convictions, and refused to accept the Légion d’Honneur when it was offered by the French government. Sadly his wife died shortly after his return, leaving Cortès and his daughter, Jaqueline, alone. The two settled in Paris, where Cortès continued to paint his famous views of the city. The dedicated artist would stand at his easel for around eight to ten hours a day, making the most of the natural light, while he painted the streets down below. During the years of World War II, Cortès and his family spent their time in Normandy, in an attempt to remove themselves from the harsh realities of war. In 1954, Èdouard Cortès had relocated to Lagny, where he passed his life in a simple manner among a small circle of friends. Cortès continued to paint mastering several mediums, to execute his exquisite variations of his primary theme, the beauty of Paris. When asked why his works stilled showed horse-drawn carriages, omnibuses and fashions from before 1930, Cortès commented that he wished to stop history in 1939 before the Second World War. His paintings by now were in demand all over the world, and Cortès achieved special success in the United States and Canada, where he had first exhibited in 1945. We are pleased to have a number of artworks by Cortès on display at our winter exhibition this December. Click the button below to find out more.